As part of the country’s effort to diversify its energy resources and improve electrification nationwide, Equatorial Guinea (República de Guinea Ecuatorial) has undertaken the construction of the Djibloho Hydroelectric Plant on the continental region, near the city of Añisok. 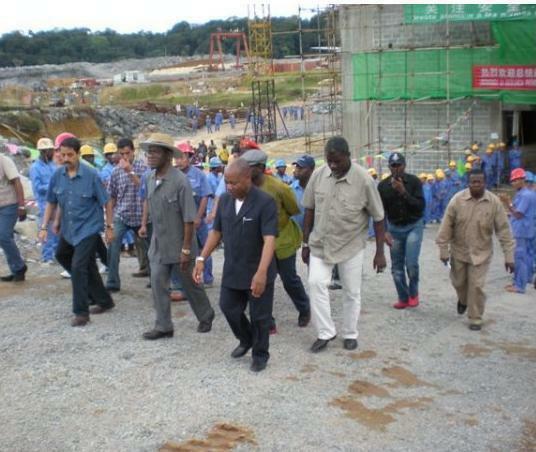 President Obiang Nguema Mbasogo visited the plant to witness the positive developments as the plant reaches completion in November 2011. President Obiang, accompanied by the Minister of State for Agriculture and Forestry, Teodoro Nguema Obiang Mangue, and the Minister of Mines and Energy, Marcelino Owono Edu, toured the hydroelectric plant and received technical explanations about the various facilities. Sinohydro Corporation Ltd., a Chinese company, began construction of the plant in March 2008. The Djibloho Hydroelectric and Distribution Plant will generate over 220 kilowatts to supply electricity to the mainland region. This ambitious project, whose first phase is expected to be delivered in 2011, is funded entirely by the Government of Equatorial Guinea and is one of the largest infrastructure investments thus far. This visit follows President Obiang’s recent trip to the city of Aconibe, accompanied by the First Lady, Constancia Mangue de Obiang. During his stay in Aconibe, President Obiang chaired ground breaking ceremonies for a total of 26 social projects, funded entirely by the government at a cost of more than XAF$2,200 million francs. The projects include the construction of a new Aconibe health center, drinking water capture and storage facility, a new school, local government offices, 24 social housing projects, and of several roads in the center of the city and surrounding villages. This effort is part of the Equatorial Guinea’s multi-year program to upgrade and enhance the infrastructure of the country. The government’s Horizon 2020 development plan, put in motion by President Obiang, has made infrastructure development a central goal to drive the country to become an emergent and sustainable economy by 2020.